company; 1960—directed the film The Alamo . 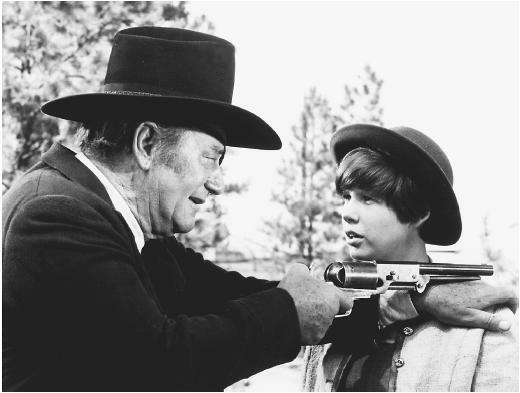 Awards: Best Actor Academy Award, for True Grit , 1969. Died: In Los Angeles, 11 June 1979. "Why I Turned Producer and Director," in Journal of Screen Producers Guild (Hollywood), September 1960. "John Wayne Talks Tough," by Joe McInery, in Film Comment (New York), September 1972. "Looking Back," interview with Scott Eyman, in Focus on Film (London), Spring 1975. Fenin, George, and William K. Everson, The Western, from Silents to Cinerama , New York, 1962. Ricci, Mark, Boris Zmijewsky, and Steve Zmijewsky, The Films of John Wayne , New York, 1970. Tomkies, Mike, The Big Man: The John Wayne Story , London, 1971; as Duke , Chicago, 1971. Zolotow, Maurice, Shooting Star: A Biography of John Wayne , New York, 1974. Campbell, George Jr., The John Wayne Story , New Rochelle, New York, 1979. Pascal, François, John Wayne: Le Dernier Géant , Paris, 1979. Scheldeman, Ivan, De films van John Wayne , Borgerhout, Belgium, 1979. Kieskalt, Charles John, The Official John Wayne Reference Book , Secaucus, New Jersey, 1985; rev. ed., 1993. McDonald, Archie P., editor, Shooting Stars: Heroes and Heroines of Western Film , Bloomington, Indiana, 1987. Levy, Emanuel, John Wayne: Prophet of the American Way of Life , Metuchen, New Jersey, 1988, 1998. Leguege, Eric, John Wayne, le cow-boy et la mort , Paris, 1989. Wayne, Pilar, with Alex Thorleifson, John Wayne: My Life with the Duke , New York, 1989. Wayne, Aissa, John Wayne, My Father , New York, 1991. Minshall, Bert, On Board with the Duke: John Wayne and the Wild Goose, Washington, D.C., 1992. Riggin, Judith M., John Wayne: A Bio-Bibliography , New York, 1992. Nardo, Don, John Wayne , New York, 1994. Clark, Donald, John Wayne's "The Alamo": The Making of the Epic Film , Carol Publishing Group, 1995. Marill, Alvin H., The Great John Wayne Trivia Book , Secaucus, New Jersey, 1995. Roberts, Randy, John Wayne: American , New York, 1995. Fagen, Herb, Duke, We're Glad We Knew You: John Wayne's Friend's & Colleagues Remember His Remarkable Life , Carol Publishing Group, 1998. Wills, Garry, John Wayne's America: The Politics of Celebrity , New York, 1998. McGhee, Richard D., John Wayne: Actor, Artist, Hero , Jefferson, 1999. Gray, M., "No-Contract Star," in Films and Filming (London), March 1957. Didion, Joan, "John Wayne," in The Saturday Evening Post (Philadelphia), 14 August 1965. Hall, D. J., "Tall in the Saddle," in Films and Filming (London), October 1969. Bentley, Eric, "The Political Theatre of John Wayne," in Film Society Review (New York), March/May 1972. Special issue of Film Heritage (New York), Summer 1975. Suid, L., "The Making of The Green Berets ," in Journal of Popular Film (Bowling Green, Ohio), v. 6, no. 2, 1977. Beaver, J., "John Wayne," in Films in Review (New York), May 1977, see also issue for August/September 1977 and February 1978. Obituary in New York Times , 12 June 1979. Kroll, Jack, "John Wayne," in The Movie Star , edited by Elisabeth Weis, New York, 1981. Norman, Barry, in The Film Greats , London, 1985. Villien, Bruno, "John Wayne: la force tranquille d'Amérique," in Cinématographe (Paris), February 1986. Edgerton, G., "A Reappraisal of John Wayne," in Films in Review (New York), May 1986. McGhee, R. D., "John Wayne: Hero with a Thousand Faces," in Literature/Film Quarterly (Salisbury, Maryland), January 1988. Barzman, Ben, "The Duke and Me," in Los Angeles Magazine , January 1989. Tal, K., "War Looking at Film Looking at War," in Jump Cut (Berkeley), May 1991. Bell, Joseph N., "True Wayne," in American Film , January/February 1992. Wills, G., "John Wayne's Body," in New Yorker , 19 August 1996. McNulty, Thomas and Paul M. Riordan, "John Agar, Actor: Hollywood's All-purpose Hero: More John Agar Creature Features," in Filmfax (Evanston), February-March 1997. Norman, Barry, "Was Wayne the Biggest Star of All?" in Radio Times (London), 11 October 1997. Macnab, Geoffrey, "From Sir, With Love," in Sight & Sound (London), May 1998. During his last years John Wayne's image hardened and became simplified: the movie star became either a national institution or an object of ridicule and vilification (depending upon one's political viewpoint). Wayne himself clearly encouraged this transformation, the potential for which was always there in his image, at least from the 1950s on. His decision to direct and star in The Green Berets marks a crucial point of transition, confirmed by his subsequent political pronouncements and the tendency to choose self-mythologizing roles. This development has had the unfortunate effect of obscuring for many people the complexities of the Wayne persona and the extremely interesting uses to which it was put by two of Hollywood's greatest directors, John Ford and Howard Hawks. Ford is reported as saying, after seeing Red River , that he had never realized that Wayne could act. The operative criterion of acting here appears to be the hackneyed one of versatility, the ability to "become" different characters. If a limited actor, Wayne was always, from his first major role in Stagecoach , an extremely capable performer: the scenes that develop his relationship with Claire Trevor are played with considerable delicacy and sensitivity. Though the components of the Wayne persona were already clearly present there in The Long Voyage Home , Ford did not make full use of them until after World War II, when the dominant tone of his work modulated from idealism (associated with Henry Fonda) to disillusionment and retreat into stoicism. Through the three films of the "cavalry trilogy" ( Fort Apache , She Wore a Yellow Ribbon , and Rio Grande ) the Wayne persona reaches full expression. The makings of the later "national institution" are all there—conservatism, militarism, adherence to tradition, emphasis on patriotic duty—but they are held within a complex thematic network in which the sustaining of faith in American civilization becomes increasingly problematic, giving way to stoical resignation. Significantly, Ford also used Wayne centrally in films in which he abandons American civilization altogether, for a retreat either into the Irish past ( The Quiet Man ) or to a South Seas never-never land ( Donovan's Reef ). Ford's ultimate use of Wayne, however, was as the incarnation of the lost values of a mythical Old West, rendered obsolete by the civilization it helped build, in The Man Who Shot Liberty Valance . Hawks never showed much interest in the established social order except as something to escape from, and Wayne is less central to his work than he is to Ford's. Red River , while in many ways impressive, suffers from Hawks's insufficient grasp of the material's moral and political implications, to which Wayne's Thomas Dunson is central. Interestingly, in relation to Wayne's later career, the character develops marked connotations of fascism which the film tries to cope with but finally evades. Hawks's finest use of Wayne is undoubtedly in Rio Bravo : here the stoicism, self-reliance, and assumption of moral infallibility at once achieve their most complete expression and are subjected to a subtle criticism that defines their limitations. The infallible Wayne is alternately juxtaposed with the all-too-fallible Dean Martin and confronted with the amorous but ironic Angie Dickinson. Both relationships are being used by Hawks to probe, question, and affectionately satirize the Wayne image, exposing its human deficiencies while reaffirming its strength. It is with Hawks also—in El Dorado and Rio Lobo —that Wayne enters the last phase of his career, where the central concern becomes age and failing powers. The Cowboys was not, as some asserted, the first film in which Wayne died (they forget, for example, Reap the Wild Wind , Sands of Iwo Jima , and, far more reprehensibly, Liberty Valance ), but it is the first of his major roles in which he was killed face-to-face by the bad guy. Even more pertinent is The Shootist , in which he plays an aging gunfighter who is dying of cancer, the disease against which he himself struggled throughout this late period. If The Cowboys (in which Wayne explicitly becomes a role model for the young of America) celebrates the "national institution," even at this stage of his career where the image is at its most petrified it still carries connotations—pain, loss, failure, stoical endurance—which makes it less simple than the popular view of "hawk" patriarch suggests. Perhaps due to Wayne's larger-than-life iconography as the quintessential American hero, he is as popular with audiences today as he was during his lifetime. His films are never off the television screen and remain among the fastest sellers in video stores. His directorial debut, The Alamo , a personal project in which he also starred, has been restored to its original director's cut length after 30 years during which only the abbreviated version released to theaters by United Artists was available—and reissued on tape and laser disc to the lucrative collector's market in a format that retained the film's wide-screen grandeur. In the wake of its commercial success, two of Wayne's rowdiest and most popular non-Ford and non-Hawks Westerns, McLintock and Hondo , have finally found their way to television and video stores after many years of hibernation, as well. In His later years I was at the Hotel Del Coronado, where he appeared for the only State Dinner held outside the White House. He was with his good friend Willie (the Shoe)) Shoemaker. Also accompanied by Pat O'Brian,, but am not certain, old age. Can you confirm o deny? Thank You, from an Old fan of the Duke. I spent about three weeks with the Secret Service preparing for the gala, making sure there was no threat.